"Mussolini" redirects here. For other people named Mussolini, see Mussolini family. Benito Amilcare Andrea Mussolini (Italian: [beˈniːto mussoˈliːni] ;  29 July 1883 – 28 April 1945) was an Italian politician and journalist who was the leader of the National Fascist Party (Partito Nazionale Fascista, PNF). He ruled Italy as Prime Minister from 1922 to 1943; he constitutionally led the country until 1925, when he dropped the pretense of democracy and established a dictatorship. The National Fascist Party was an Italian political party, created by Benito Mussolini as the political expression of fascism. The party ruled Italy from 1922 when Fascists took power with the March on Rome to 1943, when Mussolini was deposed by the Grand Council of Fascism. The President of the Council of Ministers of the Italian Republic, commonly referred to in Italy as Presidente del Consiglio, or informally as Premier and known in English as the Prime Minister of Italy, is the head of government of the Italian Republic. The office of Prime Minister is established by Articles 92 through to 96 of the Constitution of Italy. The Prime Minister is appointed by the President of the Republic after each general election and must have the confidence of the Italian Parliament to stay in office. Known as Il Duce ("The Leader"), Mussolini was the founder of Italian Fascism. 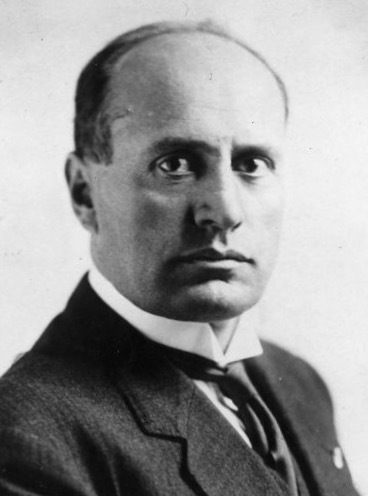 In 1912, Mussolini had been a leading member of the National Directorate of the Italian Socialist Party (PSI),  but was expelled from the PSI for advocating military intervention in World War I, in opposition to the party's stance on neutrality. Mussolini served in the Royal Italian Army during the war until he was wounded and discharged in 1917. 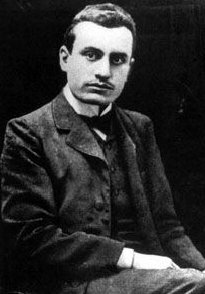 Mussolini denounced the PSI, his views now centering on nationalism instead of socialism and later founded the fascist movement which came to oppose egalitarianism  and class conflict, instead advocating "revolutionary nationalism" transcending class lines. Following the March on Rome in October 1922, Mussolini became the youngest Prime Minister in Italian history until the appointment of Matteo Renzi in February 2014. After removing all political opposition through his secret police and outlawing labor strikes,  Mussolini and his followers consolidated their power through a series of laws that transformed the nation into a one-party dictatorship. Within five years, Mussolini had established dictatorial authority by both legal and extraordinary means and aspired to create a totalitarian state. In 1929, Mussolini signed the Lateran Treaty with the Vatican, ending decades of struggle between the Italian state and the Papacy, and recognized the independence of Vatican City. Duce is an Italian title, derived from the Latin word dux, and a cognate of duke. National Fascist Party leader Benito Mussolini was identified by Fascists as Il Duce of the movement. In 1925 it became a reference to the dictatorial position of Sua Eccellenza Benito Mussolini, Capo del Governo, Duce del Fascismo e Fondatore dell'Impero. Mussolini held this title together with that of President of the Council of Ministers: this was the constitutional position which entitled him to rule Italy on behalf of the King of Italy. Founder of the Empire was added for the exclusive use by Mussolini in recognition of his founding of an official legal entity of the Italian Empire on behalf of the King in 1936 following Italy's victory in the Second Italo-Ethiopian War. The position was held by Mussolini until 1943, when he was removed from office by the King and the position of "Duce" was dismantled, while Marshal The 1st Duke of Addis Abeba was appointed Presidente del Consiglio. The Italian Socialist Party was a socialist and later social-democratic political party in Italy. Founded in Genoa in 1892, the PSI dominated the Italian left until after World War II, when it was eclipsed in status by the Italian Communist Party. The Socialists came to special prominence in the 1980s, when their leader Bettino Craxi, who had severed the residual ties with the Soviet Union and re-branded the party as liberal-socialist, served as Prime Minister (1983–1987). The PSI was disbanded in 1994 as a result of the Tangentopoli scandals. Prior to World War I, future dictator Benito Mussolini was a member of the PSI. After the Abyssinia Crisis of 1935–1936, Mussolini invaded Ethiopia in the Second Italo–Ethiopian War. The invasion was condemned by the Western powers and was answered with economic sanctions against Italy. Relations between Germany and Italy improved due to Hitler's support of the invasion. In 1936, Mussolini surrendered Austria to the German sphere of influence, signed the treaty of cooperation with Germany and proclaimed the creation of a Rome–Berlin Axis. 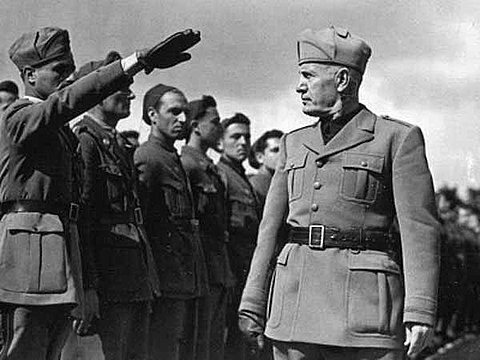 From 1936 through 1939, Mussolini provided huge amounts of military support to Franco's forces in the Spanish Civil War. This active intervention further distanced Italy from France and Britain. Mussolini had sought to delay a major war in Europe, but Germany invaded Poland on 1 September 1939, resulting in declarations of war by France and the UK and the start of World War II. On 10 June 1940—with the Fall of France imminent—Italy officially entered the war on the side of Germany, though Mussolini was aware that Italy did not have the military capacity and resources to carry out a long war with the British Empire. He believed that after the imminent French armistice, Italy could gain territorial concessions from France, and he could then concentrate his forces on a major offensive in North Africa, where British and Commonwealth forces were outnumbered by Italian forces. However, the British government refused to accept proposals for a peace that would involve accepting Axis victories in Eastern and Western Europe; plans for an invasion of the UK did not proceed and the war continued. In October 1940, Mussolini sent Italian forces into Greece, starting the Greco-Italian War. The invasion failed and the following Greek counter-offensive pushed the Italians back to occupied Albania. The Greek debacle and simultaneous defeats against the British in North Africa reduced Italy to dependence on Germany. The Abyssinia Crisis was a crisis in 1935 originating in what was called the Walwal incident in the then-ongoing conflict between the Kingdom of Italy and the Empire of Ethiopia. The League of Nations ruled against Italy and voted for economic sanctions, but they were never fully applied. Italy ignored the sanctions, quit the League, made special deals with Britain and France and ultimately established control of Ethiopia. The crisis discredited the League and moved Fascist Italy closer to an alliance with Nazi Germany. Beginning in June 1941, Mussolini sent Italian forces to participate in the invasion of the Soviet Union, and Italy declared war on the United States in December. In 1943, Italy suffered one disaster after another: by February the Red Army had completely destroyed the Italian Army in Russia; in May the Axis collapsed in North Africa; on 9 July the Allies invaded Sicily; and by the 16th it became clear the German summer offensive in the USSR had failed. As a consequence, early on 25 July, the Grand Council of Fascism passed a motion of no confidence for Mussolini; later that day the King dismissed him as head of government and had him placed in custody, appointing Pietro Badoglio to succeed him as Prime Minister. 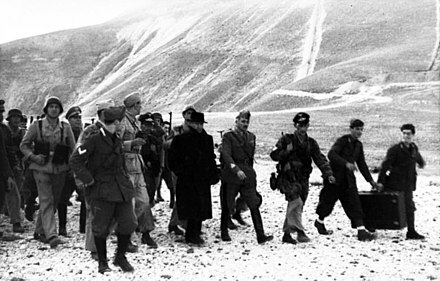 After the king agreed the armistice with the allies, on 12 September 1943 Mussolini was rescued from captivity in the Gran Sasso raid by German paratroopers and Waffen-SS commandos led by Major Otto-Harald Mors. On December 11, 1941, Italy declared war on the United States in response to the latter's declaration of war upon the Empire of Japan following the attack on Pearl Harbor four days earlier. Germany also declared war on the U.S. the same day. The US immediately responded by declaring war on Germany and Italy, thus thrusting the United States in fighting two major fronts across the Pacific and Atlantic Oceans in World War II. 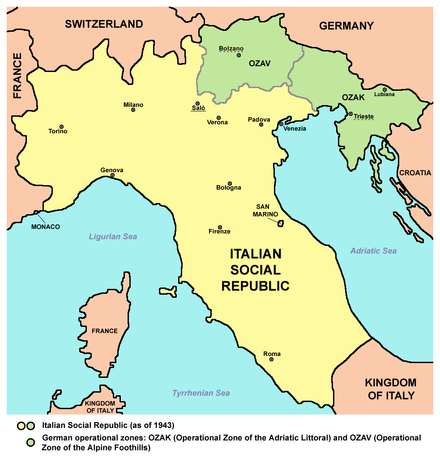 The Italian Social Republic, popularly and historically known as the Republic of Salò, was a German puppet state with limited recognition that was created during the later part of World War II, existing from the beginning of German occupation of Italy in September 1943 until the surrender of German troops in Italy in May 1945. Mussolini was born on 29 July 1883 in Dovia di Predappio, a small town in the province of Forlì in Romagna. Later, during the Fascist era, Predappio was dubbed "Duce's town" and Forlì was called "Duce's city", with pilgrims going to Predappio and Forlì to see the birthplace of Mussolini. Predappio a town and comune in the province of Forlì-Cesena, in the region of Emilia-Romagna in Italy, with a population of 6,297. The town is best known for being the birthplace of Benito Mussolini, dictator of Italy from 1922 to 1943. 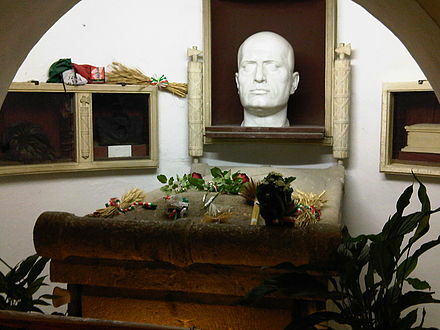 Mussolini is buried at Predappio, and his mausoleum is a local tourist destination, as well as a site of pilgrimage for Fascists. Romagna is an Italian historical region that approximately corresponds to the south-eastern portion of present-day Emilia-Romagna, North Italy. Traditionally, it is limited by the Apennines to the south-west, the Adriatic to the east, and the rivers Reno and Sillaro to the north and west. The region's major cities include Cesena, Faenza, Forlì, Imola, Ravenna, Rimini and City of San Marino. The region has been recently formally expanded with the transfer of seven comuni from the Marche region, which are a small number of comuni where Romagnolo dialect is spoken. In 1902, Mussolini emigrated to Switzerland, partly to avoid military service. He worked briefly as a stonemason in Geneva, Fribourg and Bern, but was unable to find a permanent job. In February 1909,  Mussolini once again left Italy, this time to take the job as the secretary of the labor party in the Italian-speaking city of Trento, which at the time was part of Austria-Hungary. He also did office work for the local Socialist Party, and edited its newspaper L'Avvenire del Lavoratore (The Future of the Worker). Returning to Italy, he spent a brief time in Milan, and then in 1910 he returned to his hometown of Forlì, where he edited the weekly Lotta di classe (The Class Struggle). Mussolini thought of himself as an intellectual and was considered to be well-read. He read avidly; his favorites in European philosophy included Sorel, the Italian Futurist Filippo Tommaso Marinetti, French Socialist Gustave Hervé, Italian anarchist Errico Malatesta and German philosophers Friedrich Engels and Karl Marx, the founders of Marxism. Mussolini had taught himself French and German and translated excerpts from Nietzsche, Schopenhauer and Kant. Mussolini as director of Avanti! 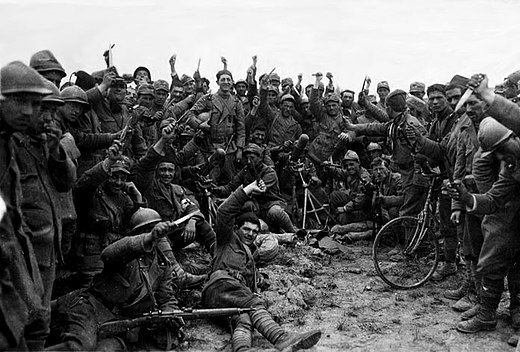 Members of Italy's Arditi corps in 1918 holding daggers, a symbol of their group. The Arditi's black uniform and use of the fez were adopted by Mussolini in the creation of his Fascist movement. 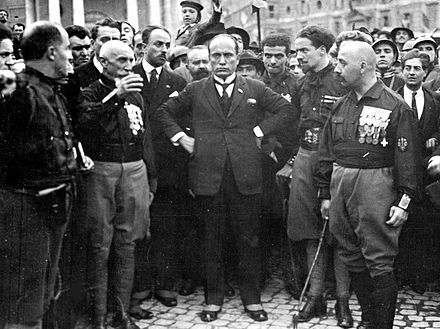 As Mussolini's support for the intervention solidified, he came into conflict with socialists who opposed the war. He attacked the opponents of the war and claimed that those proletarians who supported pacifism were out of step with the proletarians who had joined the rising interventionist vanguard that was preparing Italy for a revolutionary war. He began to criticize the Italian Socialist Party and socialism itself for having failed to recognize the national problems that had led to the outbreak of the war. He was expelled from the party for his support of intervention. Mussolini's military experience is told in his work Diario di guerra. Overall, he totaled about nine months of active, front-line trench warfare. During this time, he contracted paratyphoid fever. His military exploits ended in 1917 when he was wounded accidentally by the explosion of a mortar bomb in his trench. He was left with at least 40 shards of metal in his body. He was discharged from the hospital in August 1917 and resumed his editor-in-chief position at his new paper, Il Popolo d'Italia. 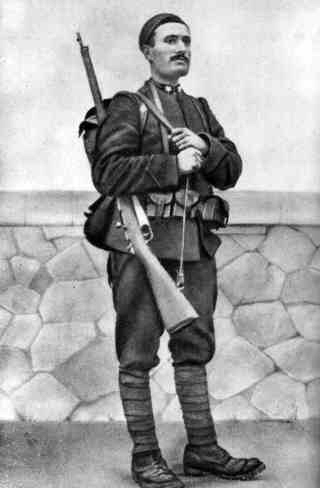 He wrote there positive articles about Czechoslovak Legions in Italy. On 25 December 1915, in Treviglio, he contracted a marriage with his fellow countrywoman Rachele Guidi, who had already borne him a daughter, Edda, at Forlì in 1910. In 1915, he had a son with Ida Dalser, a woman born in Sopramonte, a village near Trento. He legally recognized this son on 11 January 1916. 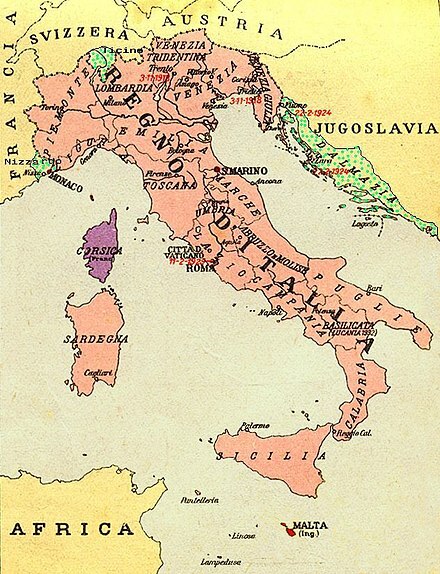 Italia Irredenta: regions considered Italian for ethnic, geographic or historical reasons, and claimed by the Fascists in the 1930s: green: Nice, Ticino, and Dalmatia; red: Malta; violet: later claims extended to Corsica, Savoy and Corfu. While Italy occupied former Austro-Hungarian areas between years 1918 and 1920, five hundred "Slav" societies (for example Sokol) and slightly smaller number of libraries ("reading rooms") had been forbidden, specifically so later with the Law on Associations (1925), the Law on Public Demonstrations (1926) and the Law on Public Order (1926)—the closure of the classical lyceum in Pazin, of the high school in Voloska (1918), and the five hundred Slovene and Croatian primary schools followed. One thousand "Slav" teachers were forcibly exiled to Sardinia and to Southern Italy. In 1923, Mussolini sent Italian forces to invade Corfu during the Corfu incident. In the end, the League of Nations proved powerless, and Greece was forced to comply with Italian demands. In June 1923, the government passed the Acerbo Law, which transformed Italy into a single national constituency. It also granted a two-thirds majority of the seats in Parliament to the party or group of parties that received at least 25% of the votes. [ citation needed ] This law applied in the elections of 6 April 1924. The national alliance, consisting of Fascists, most of the old Liberals and others, won 64% of the vote. 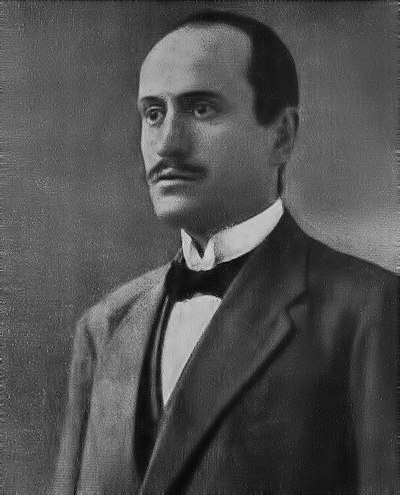 The assassination of the socialist deputy Giacomo Matteotti, who had requested that the elections be annulled because of the irregularities,  provoked a momentary crisis in the Mussolini government. Mussolini ordered a cover-up, but witnesses saw the car that transported Matteotti's body parked outside Matteotti's residence, which linked Amerigo Dumini to the murder. Mussolini later confessed that a few resolute men could have altered public opinion and started a coup that would have swept fascism away. Dumini was imprisoned for two years. On his release, Dumini allegedly told other people that Mussolini was responsible, for which he served further prison time. The opposition parties responded weakly or were generally unresponsive. Many of the socialists, liberals, and moderates boycotted Parliament in the Aventine Secession, hoping to force Victor Emmanuel to dismiss Mussolini. Between 1925 and 1927, Mussolini progressively dismantled virtually all constitutional and conventional restraints on his power and built a police state. A law passed on 24 December 1925—Christmas Eve for the largely Roman Catholic country—changed Mussolini's formal title from "President of the Council of Ministers" to "Head of the Government", although he was still called "Prime Minister" by most non-Italian news sources. He was no longer responsible to Parliament and could be removed only by the King. While the Italian constitution stated that ministers were responsible only to the sovereign, in practice it had become all but impossible to govern against the express will of Parliament. The Christmas Eve law ended this practice, and also made Mussolini the only person competent to determine the body's agenda. This law transformed Mussolini's government into a de facto legal dictatorship. Local autonomy was abolished, and podestàs appointed by the Italian Senate replaced elected mayors and councils. 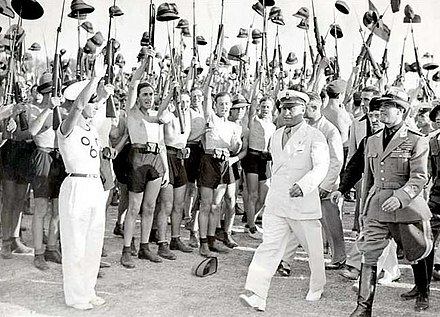 Mussolini launched several public construction programs and government initiatives throughout Italy to combat economic setbacks or unemployment levels. His earliest (and one of the best known) was the Battle for Wheat, by which 5,000 new farms were established and five new agricultural towns (among them Littoria and Sabaudia) on land reclaimed by draining the Pontine Marshes. In Sardinia, a model agricultural town was founded and named Mussolinia, but has long since been renamed Arborea. This town was the first of what Mussolini hoped would have been thousands of new agricultural settlements across the country. The Battle for Wheat diverted valuable resources to wheat production away from other more economically viable crops. Landowners grew wheat on unsuitable soil using all the advances of modern science, and although the wheat harvest increased, prices rose, consumption fell and high tariffs were imposed. The tariffs promoted widespread inefficiencies and the government subsidies given to farmers pushed the country further into debt. Mussolini also initiated the "Battle for Land", a policy based on land reclamation outlined in 1928. The initiative had a mixed success; while projects such as the draining of the Pontine Marsh in 1935 for agriculture were good for propaganda purposes, provided work for the unemployed and allowed for great land owners to control subsidies, other areas in the Battle for Land were not very successful. This program was inconsistent with the Battle for Wheat (small plots of land were inappropriately allocated for large-scale wheat production), and the Pontine Marsh was lost during World War II. Fewer than 10,000 peasants resettled on the redistributed land, and peasant poverty remained high. The Battle for Land initiative was abandoned in 1940. In 1930, in the Doctrine of Fascism he wrote, "The so-called crisis can only be settled by State action and within the orbit of the State." He tried to combat economic recession by introducing a "Gold for the Fatherland" initiative, encouraging the public to voluntarily donate gold jewelry to government officials in exchange for steel wristbands bearing the words "Gold for the Fatherland". Even Rachele Mussolini donated her wedding ring. The collected gold was melted down and turned into gold bars, which were then distributed to the national banks. Government control of business was part of Mussolini's policy planning. By 1935, he claimed that three-quarters of Italian businesses were under state control. Later that year, Mussolini issued several edicts to further control the economy, e.g. forcing banks, businesses, and private citizens to surrender all foreign-issued stock and bond holdings to the Bank of Italy. In 1936, he imposed price controls. He also attempted to turn Italy into a self-sufficient autarky, instituting high barriers on trade with most countries except Germany. In 1943, Mussolini proposed the theory of economic socialization. Mussolini's foremost priority was the subjugation of the minds of the Italian people through the use of propaganda. The regime promoted a lavish cult of personality centered on the figure of Mussolini. He pretended to incarnate the new fascist Übermensch, promoting an aesthetic of exasperated Machism that attributed to him quasi-divine capacities. 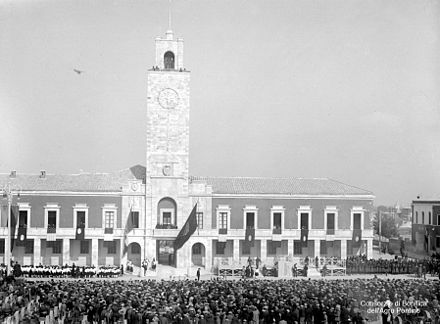 At various times after 1922, Mussolini personally took over the ministries of the interior, foreign affairs, colonies, corporations, defense, and public works. Sometimes he held as many as seven departments simultaneously, as well as the premiership. He was also head of the all-powerful Fascist Party and the armed local fascist militia, the MVSN or "Blackshirts", who terrorized incipient resistance in the cities and provinces. He would later form the OVRA, an institutionalized secret police that carried official state support. In this way he succeeded in keeping power in his own hands and preventing the emergence of any rival. Mussolini also portrayed himself as a valiant sportsman and a skilled musician. All teachers in schools and universities had to swear an oath to defend the fascist regime. Newspaper editors were all personally chosen by Mussolini, and only those in possession of a certificate of approval from the Fascist Party could practice journalism. These certificates were issued in secret; Mussolini thus skillfully created the illusion of a "free press". The trade unions were also deprived of any independence and were integrated into what was called the "corporative" system. The aim, inspired by medieval guilds and never completely achieved, was to place all Italians in various professional organizations or corporations, all under clandestine governmental control. Large sums of money were spent on highly visible public works and on international prestige projects. Thes included as the Blue Riband ocean liner SS Rex; setting aeronautical records with the world's fastest seaplane, the Macchi M.C.72; and the transatlantic flying boat cruise of Italo Balbo, which was greeted with much fanfare in the United States when it landed in Chicago in 1933. Nationalists in the years after World War I thought of themselves as combating the liberal and domineering institutions created by cabinets—such as those of Giovanni Giolitti, including traditional schooling. Futurism, a revolutionary cultural movement which would serve as a catalyst for Fascism, argued for "a school for physical courage and patriotism", as expressed by Filippo Tommaso Marinetti in 1919. Marinetti expressed his disdain for "the by now prehistoric and troglodyte Ancient Greek and Latin courses", arguing for their replacement with exercise modelled on those of the Arditi soldiers ("[learning] to advance on hands and knees in front of razing machine gun fire; to wait open-eyed for a crossbeam to move sideways over their heads etc."). It was in those years that the first Fascist youth wings were formed: Avanguardia Giovanile Fascista (Fascist Youth Vanguards) in 1919, and Gruppi Universitari Fascisti (Fascist University Groups) in 1922. After the March on Rome that brought Mussolini to power, the Fascists started considering ways to politicize Italian society, with an accent on education. Mussolini assigned former ardito and deputy-secretary for Education Renato Ricci the task of "reorganizing the youth from a moral and physical point of view." Ricci sought inspiration with Robert Baden-Powell, the founder of Scouting, meeting with him in England, as well as with Bauhaus artists in Germany. The Opera Nazionale Balilla was created through Mussolini's decree of 3 April 1926, and was led by Ricci for the following eleven years. It included children between the ages of 8 and 18, grouped as the Balilla and the Avanguardisti. According to Mussolini: "Fascist education is moral, physical, social, and military: it aims to create a complete and harmoniously developed human, a fascist one according to our views". Mussolini structured this process taking in view the emotional side of childhood: "Childhood and adolescence alike ... cannot be fed solely by concerts, theories, and abstract teaching. The truth we aim to teach them should appeal foremost to their fantasy, to their hearts, and only then to their minds". The "educational value set through action and example" was to replace the established approaches. Fascism opposed its version of idealism to prevalent rationalism, and used the Opera Nazionale Balilla to circumvent educational tradition by imposing the collective and hierarchy, as well as Mussolini's own personality cult. The 1929 treaty included a legal provision whereby the Italian government would protect the honor and dignity of the Pope by prosecuting offenders. In 1927, Mussolini was re-baptized by a Roman Catholic priest. After 1929, Mussolini, with his anti-Communist doctrines, convinced many Catholics to actively support him. After Adolf Hitler came into power, threatening Italian interests in Austria and the Danube basin, Mussolini proposed the Four Power Pact with Britain, France and Germany in 1933. When the Austrian 'austro-fascist' Chancellor Engelbert Dollfuss with dictatorial power was assassinated on 25 July 1934 by National-Socialist supporters, Mussolini even threatened Germany with war in the event of a German invasion of Austria. Mussolini for a period of time continued strictly opposing any German attempt to obtain Anschluss and promoted the ephemeral Stresa Front against Germany in 1935. On 25 October 1936, an alliance was declared between Italy and Germany, which came to be known as the Rome-Berlin Axis. From 1936 through 1939, Mussolini provided huge amounts of military support to the Nationalists in the Spanish Civil War. This active intervention on the side of Franco further distanced Italy from France and Britain. 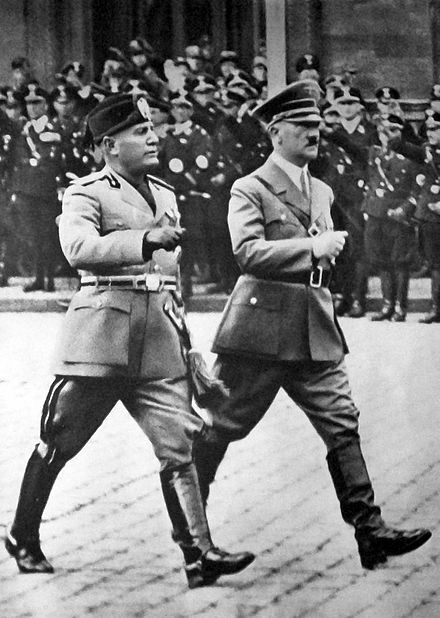 As a result, Mussolini's relationship with Adolf Hitler became closer, and he chose to accept the German annexation of Austria in 1938, followed by the dismemberment of Czechoslovakia in 1939. 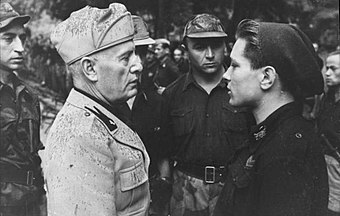 In May 1938, during Hitler's visit to Italy, Mussolini told the Führer that Italy and France were deadly enemies fighting on "opposite sides of the barricade" concerning the Spanish Civil War, and the Stresa Front was "dead and buried". 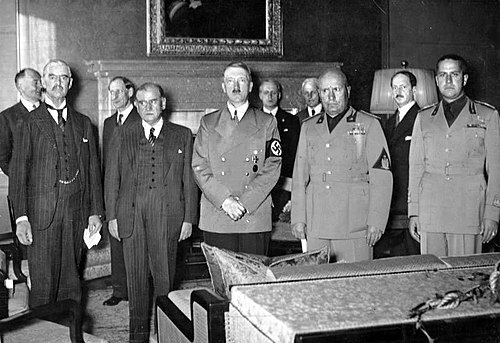 At the Munich Conference in September 1938, Mussolini continued to pose as a moderate working for European peace, while helping Nazi Germany annex the Sudetenland. 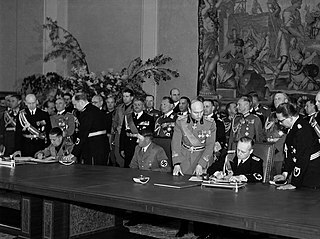 The 1936 Axis agreement with Germany was strengthened by signing the Pact of Steel on 22 May 1939, that bound together Fascist Italy and Nazi Germany in a full military alliance. Members of TIGR, a Slovene anti-fascist group, plotted to kill Mussolini in Kobarid in 1938, but their attempt was unsuccessful. Such was the extent of Mussolini's belief that it was Italy's destino to rule the Mediterranean because of Italy's high birth rate that he neglected much of the serious planning and preparations necessary for a war with the Western powers. The only arguments that held Mussolini back from full alignment with Berlin were his awareness of Italy's economic and military weakness, meaning he required further time to rearm, and his desire to use the Easter Accords of April 1938 as a way of splitting Britain from France. A military alliance with Germany as opposed to the already existing looser political alliance with the Reich under the Anti-Comintern Pact (which had no military commitments) would end any chance of Britain implementing the Easter Accords. The Easter Accords in turn were intended by Mussolini to allow Italy to take on France alone by sufficiently improving Anglo-Italian relations that London would presumably remain neutral in the event of a Franco-Italian war (Mussolini had imperial designs on Tunisia, and had some support in that country  ). In turn, the Easter Accords were intended by Britain to win Italy away from Germany. 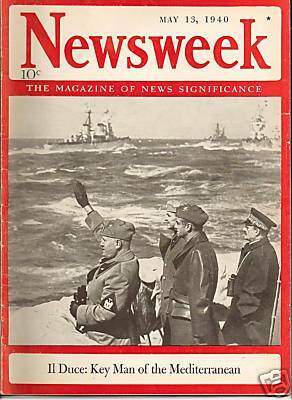 Cover of Newsweek magazine, 13 May 1940, headlined: "Il Duce: key man of the Mediterranean"
In September 1940, the Italian Tenth Army was commanded by General Rodolfo Graziani and crossed from Italian Libya into Egypt, where British forces were located; this would become the Western Desert Campaign. Advances were successful, but the Italians stopped at Sidi Barrani waiting for logistic supplies to catch up. On 24 October 1940, Mussolini sent the Italian Air Corps to Belgium, where it took part in the Blitz until January 1941. In October, Mussolini also sent Italian forces into Greece, starting the Greco-Italian War. After initial success, this backfired as the Greek counterattack proved relentless, resulting in Italy losing one-quarter of Albania. 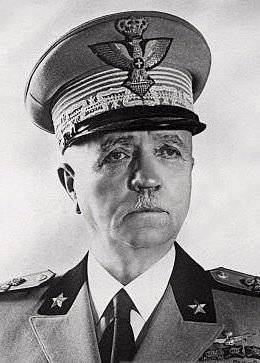 Marshal Pietro Badoglio succeeded Mussolini as Prime Minister. Italian radio statement announcing the dismissal of Mussolini and appointment of Badoglio, 25 July 1943. A rain-soaked Benito Mussolini reviewing adolescent soldiers in northern Italy, late 1944. On 25 April 1945, allied troops were advancing into northern Italy, and the collapse of the Salò Republic was imminent. Mussolini and his mistress Clara Petacci set out for Switzerland, intending to board a plane and escape to Spain. Two days later on 27 April, they were stopped near the village of Dongo (Lake Como) by communist partisans named Valerio and Bellini and identified by the Political Commissar of the partisans' 52nd Garibaldi Brigade, Urbano Lazzaro. During this time, Petacci's brother posed as a Spanish consul. After several unsuccessful attempts to take them to Como they were brought to Mezzegra. They spent their last night in the house of the De Maria family. The next day, Mussolini and Petacci were both summarily shot, along with most of the members of their 15-man train, primarily ministers and officials of the Italian Social Republic. The shootings took place in the small village of Giulino di Mezzegra and were conducted by a partisan leader who used the nom de guerre Colonnello Valerio. His real identity is unknown, but conventionally he is thought to have been Walter Audisio, who always claimed to have carried out the execution, though another partisan controversially alleged that Colonnello Valerio was Luigi Longo, subsequently a leading communist politician in post-war Italy. Mussolini was killed two days before Hitler and his wife Eva Braun committed suicide. The RSI only survived for another four days before Mussolini's defence minister, Rodolfo Graziani–the lone Italian marshal who remained loyal to Fascism after 1943–surrendered its remains on 1 May. After being kicked and spat upon, the bodies were hung upside down from the roof of an Esso gas station. The bodies were then stoned from below by civilians. This was done both to discourage any Fascists from continuing the fight, and as an act of revenge for the hanging of many partisans in the same place by Axis authorities. The corpse of the deposed leader was subject to ridicule and abuse. Fascist loyalist Achille Starace was captured and sentenced to death and then taken to the Piazzale Loreto and shown the body of Mussolini. 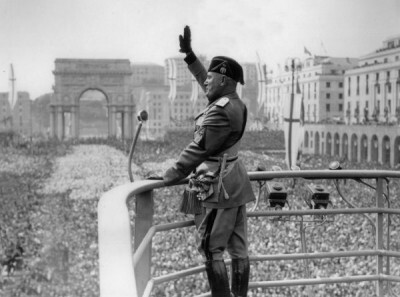 Starace, who once said of Mussolini "He is a god,"  saluted what was left of his leader just before he was shot. 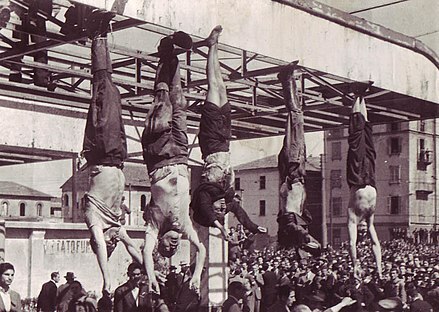 The body of Starace was subsequently hung up next to that of Mussolini. After his death and the display of his corpse in Milan, Mussolini was buried in an unmarked grave in the Musocco cemetery, to the north of the city. 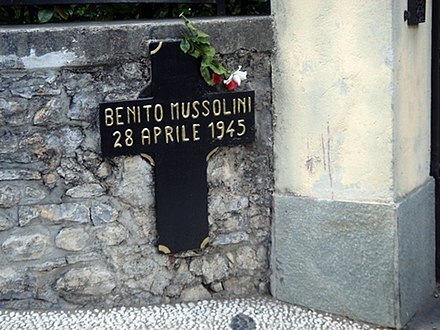 On Easter Sunday 1946, his body was located and dug up by Domenico Leccisi and two other neo-Fascists. 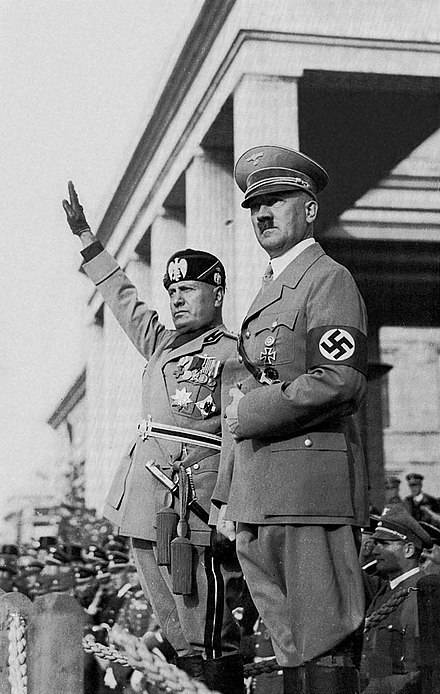 The relationship between Mussolini and Adolf Hitler was a contentious one early on. While Hitler cited Mussolini as an influence and privately expressed great admiration for him,  Mussolini had little regard for Hitler, especially after the Nazis had assassinated his friend and ally, Engelbert Dollfuss, the Austrofascist dictator of Austria in 1934. But which race? Does there exist a German race? Has it ever existed? Will it ever exist? Reality, myth, or hoax of the theorists? Front page of the Italian newspaper Corriere della Sera on 11 November 1938: the fascist regime has approved the racial laws. 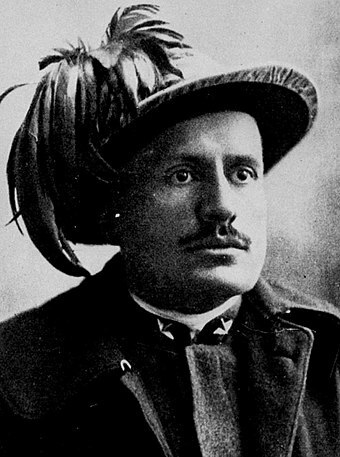 Mussolini was survived by his wife, Rachele Mussolini, two sons, Vittorio and Romano Mussolini, and his daughters Edda (the widow of Count Ciano) and Anna Maria. A third son, Bruno, was killed in an air accident while flying a Piaggio P.108 bomber on a test mission, on 7 August 1941. 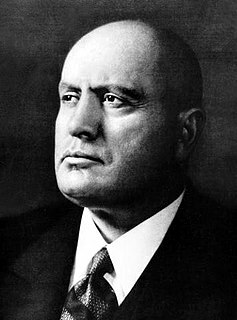 His oldest son, Benito Albino Mussolini, from his marriage with Ida Dalser, was ordered to stop declaring that Mussolini was his father and in 1935 forcibly committed to an asylum in Milan, where he was murdered on 26 August 1942 after repeated coma-inducing injections. Alessandra Mussolini, daughter of Romano Mussolini, Benito Mussolini's fourth son, and of Anna Maria Scicolone, Sophia Loren's sister, has been a member of the European Parliament for the far-right Social Alternative movement, a deputy in the Italian lower chamber and served in the Senate as a member of Silvio Berlusconi's Forza Italia party. Although the National Fascist Party was outlawed by the postwar Constitution of Italy, a number of successor neo-fascist parties emerged to carry on its legacy. Historically, the largest neo-fascist party was the Italian Social Movement (Movimento Sociale Italiano), which disbanded in 1995 and was replaced by National Alliance, a conservative party that distanced itself from Fascism (its founder, former foreign minister Gianfranco Fini, declared during an official visit to Israel that Fascism was "an absolute evil"). National Alliance and a number of neo-fascist parties were merged in 2009 to create the short-lived People of Freedom party led by then Prime Minister Silvio Berlusconi, which eventually disbanded after the defeat in the 2013 general election. Benito Mussolini, with a surfeit of bad history decaying in his imagination, could not see the plain realities before him. Like most of his generation he dramatised human affairs in incurably geographical patches, and like most of the masterful men of his time his belief in his power to mould the life about him carried him beyond sanity. From the beginning his was an ill-balanced temperament; he would be blatant at one moment, and weeping at another. He beat at the knees of Mother Reality like an unteachable child. He wanted war and conquest, triumph over definable enemies, fierce alliances, and unforgettable antagonisms. He wanted glory. He died, as his last words testify, completely unaware of the fact that the rational treatment of human affairs does not admit of that bilaterality which the traditions of warfare require. "Do we win?" he said. He persuaded himself and he persuaded great multitudes of people that two great systems of ideas faced each other in the world, "Leftism" and "Rightism", and that he and his associated Dictators embodied the latter. He did contrive finally to impose the illusion of a definitive World War upon great masses of people. Charlie Chaplin's 1940 film The Great Dictator satirizes Mussolini as "Benzino Napaloni", portrayed by Jack Oakie. In the Three Stooges' I'll Never Heil Again , Cy Schindell plays "Chizzolini", from the then topical insult of "chisler". William Saroyan wrote a short story about Mussolini in his 1971 book, Letters from 74 rue Taitbout or Don't Go But If You Must Say Hello To Everybody. More serious biographical depictions include Rod Steiger in Carlo Lizzani's 1974 movie Last Days of Mussolini , and George C. Scott's portrayal in the 1985 television mini-series Mussolini: The Untold Story. Another 1985 movie was Mussolini and I , in which Bob Hoskins plays the dictator (with Susan Sarandon as his daughter Edda and Anthony Hopkins as Count Ciano). Actor Antonio Banderas also played the title role in Benito in 1993, which covered his life from his school teacher days to the beginning of World War I, before his rise as dictator. Mussolini is also depicted in the films Tea with Mussolini , Lion of the Desert (also with Steiger) and the award-winning Italian film Vincere . "Der Mussolini" is a hit single by the German electropunk/Neue Deutsche Welle band Deutsch Amerikanische Freundschaft (DAF), from their Deutscher Schallplattenpreis-winning 1981 album Alles Ist Gut . It was covered by German-American industrial rock band KMFDM on their 2006 remix album Ruck Zuck , as well as German EBM/synthpop band And One on their 2007 EP Bodypop 1​1⁄2. 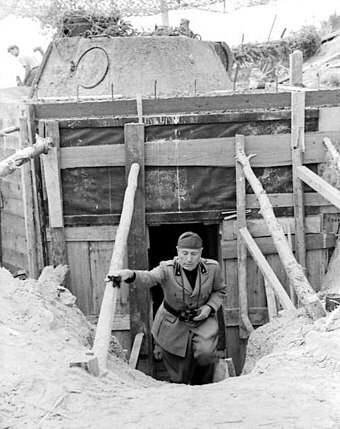 The episode "The Ghost of Nero" of the television series "Time Tunnel" depict Mussolini as a corporal; at the end of the episode, he becomes indwelt by the ghost of Nero. Fascism is a form of radical, right-wing, authoritarian ultranationalism, characterized by dictatorial power, forcible suppression of opposition, and strong regimentation of society and of the economy, which came to prominence in early 20th-century Europe. The first fascist movements emerged in Italy during World War I before it spread to other European countries. Opposed to liberalism, Marxism, and anarchism, fascism is placed on the far-right within the traditional left–right spectrum. The Pact of Steel, known formally as the Pact of Friendship and Alliance between Germany and Italy, was a military and political alliance between Italy and Germany. The events preceding World War II in Europe are closely tied to the rise of fascism and communism. Giacomo Matteotti was an Italian socialist politician. On 30 May 1924, he openly spoke in the Italian Parliament alleging the Fascists committed fraud in the recently held elections, and denounced the violence they used to gain votes. Eleven days later he was kidnapped and killed by Fascists. The March on Rome was an organized mass demonstration in October 1922, which resulted in Benito Mussolini's National Fascist Party ascending to power in the Kingdom of Italy. In late October 1922, Fascist Party leaders planned an insurrection, to take place on 28 October. When fascist troops entered Rome, Prime Minister Luigi Facta wished to declare a state of siege, but this was overruled by King Victor Emmanuel III. On the following day, 29 October 1922, the King appointed Mussolini as Prime Minister, thereby transferring political power to the fascists without armed conflict. The history of Fascist ideology is long and involves many sources. Fascists took inspiration from sources as ancient as the Spartans for their focus on national purity and their emphasis on rule by an elite minority. Fascism has also been connected to the ideals of Plato, though there are key differences between the two. Fascism styled itself as the ideological successor to Rome, particularly the Roman Empire. The Enlightenment-era concept of a "high and noble" Aryan culture as opposed to a "parasitic" Semitic culture was core to Nazi racial views. From the same era, Georg Wilhelm Friedrich Hegel's view on the absolute authority of the state also strongly influenced Fascist thinking. The French Revolution was a major influence insofar as the Nazis saw themselves as fighting back against many of the ideas which it brought to prominence, especially liberalism, liberal democracy and racial equality, whereas on the other hand Fascism drew heavily on the revolutionary ideal of nationalism. Common themes among fascist movements include; nationalism, hierarchy and elitism, militarism, quasi-religion, masculinity and voluntarism. Other aspects of fascism such as its "myth of decadence", anti‐egalitarianism and totalitarianism can be seen to originate from these ideas. These fundamental aspects however, can be attributed to a concept known as "Palingenetic ultranationalism", a theory proposed by Roger Griffin, that fascism is essentially populist ultranationalism sacralized through the myth of national rebirth and regeneration. The Manifesto of Race, sometimes known as the Charter of Race or Racial Manifesto, was a manifesto published on 14 July 1938 which prepared the enactment, in October 1938, of the Racial Laws in the Kingdom of Italy. The antisemitic laws stripped the Jews of Italian citizenship and governmental and professional positions. The manifesto demonstrated the enormous influence Adolf Hitler had over Benito Mussolini since Italy had become allied with Nazi Germany. The Italian Fasci of Combat, until 1919 called Fasci of Revolutionary Action, was an Italian fascio organization, created by Benito Mussolini in 1914. Il Popolo d'Italia, was an Italian newspaper which published editions every day with the exception for Mondays founded by Benito Mussolini in 1914, after his split from the Italian Socialist Party. The paper was founded as a pro-war newspaper during WW1. Squadrismo consisted of Italian fascist squads, mostly from rural areas, who were led by the ras from 1918–1924. As a movement, it grew from the inspiration many squadristi leaders found in Benito Mussolini, but was not directly controlled by Mussolini, and each squad tended to follow their own local leader. The squadrismo has been described as a “very undisciplined set of local bosses” where Mussolini attempted to assert some type of leadership control, although he had “not appointed” them nor had he usually met them. According to historian Stanley G. Payne, the "new mass Fascism had not been created by Mussolini," but the squadrismo had sprung up around him in rural areas, first starting in northern Italy. Fascism in Europe was composed of numerous ideologies that were present during the 20th century and they all developed their own differences with each other. Fascism was born in Italy, but subsequently several fascist movements emerged across Europe and they borrowed influences from the Italian faction. The origins of fascism in Europe began outside of Italy and can be observed in the combining of a traditional national unity and revolutionary anti-democratic rhetoric espoused by integral nationalist Charles Maurras and revolutionary syndicalist Georges Sorel in France. 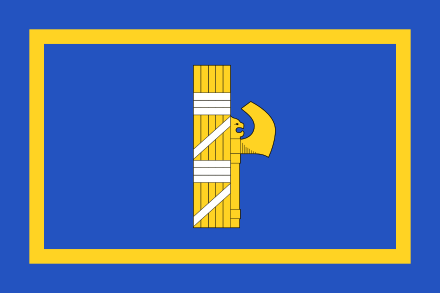 The first foundations of fascism can be seen in the Italian Regency of Carnaro, many of its politics and aesthetics were taken from Gabriele D'Annunzio's rule and they were subsequently used by Benito Mussolini and his Italian Fasci of Combat which he founded five months prior in 1919. Despite the fact that its members referred to themselves as "fascists" the ideology of fascism wouldn't fully develop until 1921 when Mussolini transformed his movement into the National Fascist Party which then in 1923 incorporated the Italian Nationalist Association. 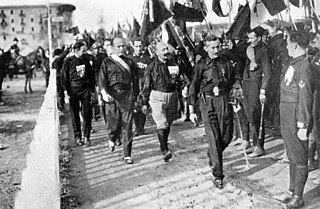 The INA was a nationalist movement that established fascist tropes, colored shirt uniforms for example, and also received the support of important proto-fascists like D'Annunzio, Alfredo Rocco and Enrico Corradini. Propaganda of Fascist Italy was the material put forth by Italian Fascism to justify its authority and programs and encourage popular support. Giuseppe Bastianini was an Italian politician and diplomat. Initially associated with the hard-line elements of the fascist movements he later became a member of the dissident tendency. The death of Benito Mussolini, the deposed Italian fascist dictator, occurred on 28 April 1945, in the final days of World War II in Europe, when he was summarily executed by Italian partisans in the small village of Giulino di Mezzegra in northern Italy. The “official” version of events is that Mussolini was shot by Walter Audisio, a communist partisan who used the nom de guerre of "Colonel Valerio". 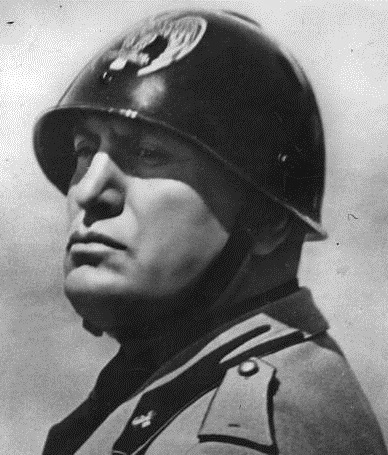 However, since the end of the war, the circumstances of Mussolini's death, and the identity of his killer, have been subjects of continuing confusion, dispute and controversy in Italy. Fascist Italy is the era of National Fascist Party government from 1922 to 1943 with Benito Mussolini as head of government of the Kingdom of Italy. The fascists imposed totalitarian rule and crushed political and intellectual opposition, while promoting economic modernization, traditional social values and a rapprochement with the Roman Catholic Church. According to Payne (1996), "[the] Fascist government passed through several relatively distinct phases". The first phase (1923–1925) was nominally a continuation of the parliamentary system, albeit with a "legally-organized executive dictatorship". Then came the second phase, "the construction of the Fascist dictatorship proper, from 1925 to 1929". The third phase, with less activism, was 1929 to 1934. The fourth phase, 1935–1940, was characterized by an aggressive foreign policy: war against Ethiopia, which was launched from Eritrea and Somaliland; confrontations with the League of Nations, leading to sanctions; growing economic autarky; and the signing of the Pact of Steel. The war itself (1940–1943) was the fifth phase with its disasters and defeats, while the rump Salò Government under German control was the final stage (1943–1945). ↑ Hakim, Joy (1995). A History of Us: War, Peace and all that Jazz. New York: Oxford University Press. ISBN 978-0-19-509514-2. ↑ "Historic Figures: Benito Mussolini (1883–1945)". 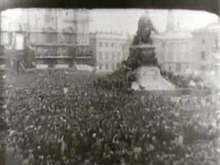 BBC – History – bbc.co.uk. ↑ "Mussolini founds the Fascist party – Mar 23, 1919". History.com. ↑ Anthony James Gregor (1979). Young Mussolini and the Intellectual Origins of Fascism. University of California Press. ISBN 978-0520037991. 1 2 Simonetta Falasca-Zamponi (1997). Fascist Spectacle: The Aesthetics of Power in Mussolini's Italy. U of California Press. p. 45. ISBN 978-0520926158. 1 2 3 4 5 Gregor 1979, p. 191. ↑ MacGregor Knox. Mussolini unleashed, 1939–1941: Politics and Strategy in Fascist Italy's Last War. Edition of 1999. Cambridge: Cambridge University Press, 1999. pp. 122–23. ↑ MacGregor Knox. Mussolini unleashed, 1939–1941: Politics and Strategy in Fascist Italy's Last War. Edition of 1999. Cambridge: Cambridge University Press, 1999. pp. 122–27. 1 2 3 4 Moseley 2004. ↑ "1945: Italian partisans kill Mussolini". BBC News. 28 April 1945. Retrieved 17 October 2011. 1 2 3 4 Charles F. Delzel, ed. (1970). Mediterranean Fascism 1919–1945. Harper Rowe. p. 3. 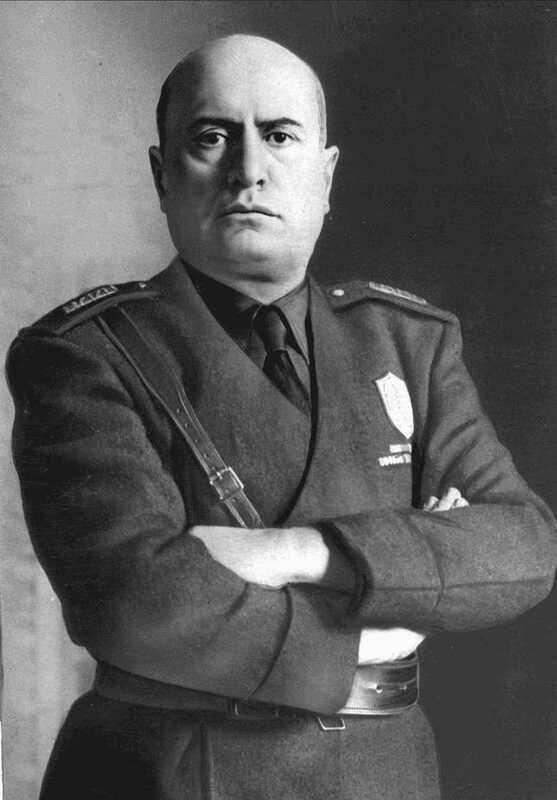 1 2 3 "Benito Mussolini". Grolier.com. 8 January 2008. Archived from the original on 5 February 2008. 1 2 3 4 Tonge, M.E. ; Henry, Stephen; Collins, Gráinne (2004). "Chapter 2". Living history 2: Italy under Fascism (New ed.). Dublin: EDCO. ISBN 978-1-84536-028-3. 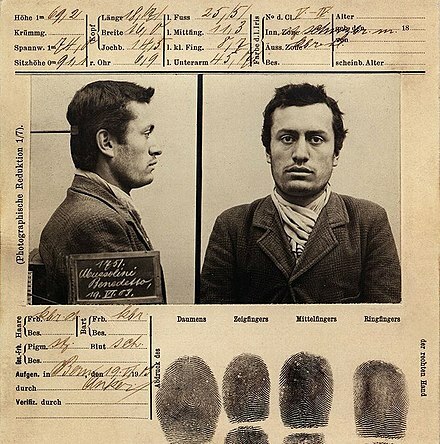 ↑ "Alessandro Mussolini 1854". GeneAll.net. 8 January 2008. ↑ De Felice, Renzo (1965). Mussolini. Il Rivoluzionario (in Italian) (1 ed.). Torino: Einaudi. p. 11. ↑ Gregor 1979, p. 29. ↑ Gregor 1979, p. 31. ↑ Mauro Cerutti:Benito Mussolini in German , French and Italian in the online Historical Dictionary of Switzerland . 1 2 3 4 5 6 7 Gunther, John (1940). Inside Europe. New York: Harper & Brothers. pp. 236–37, 239–41, 243, 245–49. ↑ Haugen, Brenda (2007). Benito Mussolini. Compass Point Books. ISBN 978-0-7565-1892-9. ↑ De Felice, Renzo (1965). Mussolini. Il Rivoluzionario (in Italian) (1 ed.). Torino: Einaudi. pp. 36–37. ↑ Marc Tribelhorn (3 April 2018). "Neue Zürcher Zeitung – Als Mussolini den Ehrendoktor der Uni Lausanne erhielt". Neue Zürcher Zeitung. Retrieved 12 November 2018. ↑ De Felice, Renzo (1965). Mussolini. Il Rivoluzionario (in Italian) (1 ed.). Torino: Einaudi. p. 46. ↑ De Felice, Renzo (1965). Mussolini. Il Rivoluzionario (in Italian) (1 ed.). Torino: Einaudi. p. 47. ↑ "Mussolini: il duce". ThinkQuest.org. 24 October 2009. Archived from the original on 10 May 2010. ↑ Georg Scheuer: Mussolinis langer Schatten. Marsch auf Rom im Nadelstreif. Köln 1996, S. 21. ↑ taken from WorldCat's entry for this book's title. 1 2 Golomb 2002, p. 249. ↑ Tucker 2005, p. 1001. ↑ Tucker 2005, p. 884. ↑ Tucker 2005, p. 335. ↑ Tucker 2005, p. 219. 1 2 Tucker 2005, p. 826. ↑ Tucker 2005, p. 209. 1 2 3 4 5 6 Gregor 1979, p. 189. ↑ Tucker 2005, p. 596. 1 2 3 4 Emil Ludwig. Nine Etched from Life. Ayer Company Publishers, 1934 (original), 1969. p. 321. ↑ Mediterranean Fascism 1919–1945 Edited by Charles F. Delzel, Harper Rowe 1970, p. 6. ↑ Dennis Mack Smith. 1997. Modern Italy; A Political History. Ann Arbor: The University of Michigan Press. p. 284. 1 2 Gregor 1979, p. 200. ↑ Gregor 1979, pp. 191–92. 1 2 Gregor 1979, p. 192. 1 2 Gregor 1979, p. 193. ↑ Gregor 1979, p. 195. ↑ Gregor 1979, pp. 193, 195. ↑ Gregor 1979, pp. 195–96. 1 2 3 Gregor 1979, p. 196. 1 2 3 Owen, Richard (13 January 2005). "Power-mad Mussolini sacrificed wife and son". The Times. UK. Archived from the original on 29 June 2011. Retrieved 14 May 2009. ↑ "We're all fascists now". Salon.com. 8 January 2008. Archived from the original on 16 April 2008. ↑ "The Rise of Benito Mussolini". 8 January 2008. Archived from the original on 9 May 2008. ↑ Moseley 2004, p. 39. ↑ Sharma, Urmila. Western Political Thought. Atlantic Publishers and Distributors (P) Ltd, 1998. p. 66. ↑ Sharma, Urmila. Western Political Thought. Atlantic Publishers and Distributors (P) Ltd, 1998. pp. 66–67. ↑ Kallis 2002, pp. 48–51. ↑ Bernard Newman (1943). The New Europe. Books for Libraries Press. pp. 307–. ISBN 978-0-8369-2963-8. ↑ Harriet Jones; Kjell Östberg; Nico Randeraad (2007). Contemporary history on trial: Europe since 1989 and the role of the expert historian. Manchester University Press. p. 155. ISBN 978-0-7190-7417-2. ↑ Kallis 2002, pp. 50–51. ↑ Kallis 2002, pp. 48–50. ↑ Kallis 2002, p. 50. ↑ Pirjevec, Jože (2008). "The Strategy of the Occupiers" (PDF). Resistance, Suffering, Hope: The Slovene Partisan Movement 1941–1945. p. 27. ISBN 978-961-6681-02-5. ↑ Glenda Sluga (2001). The Problem of Trieste and the Italo-Yugoslav Border: Difference, Identity, and Sovereignty in Twentieth-Century Europe. SUNY Press. ISBN 978-0-7914-4823-6. 1 2 3 4 5 6 Kallis 2002, p. 52. 1 2 Strang, Bruce On the Fiery March, New York: Praeger, 2003 p. 21. ↑ Roland Sarti (8 January 2008). "Fascist Modernization in Italy: Traditional or Revolutionary". The American Historical Review. 75 (4): 1029–45. doi:10.2307/1852268. JSTOR 1852268. ↑ "Mussolini's Italy". Appstate.edu. 8 January 2008. Archived from the original on 15 April 2008. ↑ Macdonald, Hamish (1999). Mussolini and Italian Fascism. Nelson Thornes. ISBN 978-0-7487-3386-6. ↑ "Ha'aretz Newspaper, Israel, 'The Jewish Mother of Fascism". Haaretz. Israel. Archived from the original on 17 June 2008. Retrieved 13 March 2009. ↑ Lyttelton, Adrian (2009). The Seizure of Power: Fascism in Italy, 1919–1929. New York: Routledge. pp. 75–77. ISBN 978-0-415-55394-0. 1 2 Paxton, Robert (2004). The Anatomy of Fascism. New York: Alfred A. Knopf. ISBN 978-1-4000-4094-0. ↑ Mussolini, Benito. "discorso sul delitto Matteotti". wikisource.it. Retrieved 24 June 2013. ↑ Cannistraro, Philip (March 1996). "Mussolini, Sacco-Vanzetti, and the Anarchists: The Transatlantic Context". The Journal of Modern History. 68 (1): 31–62. doi:10.1086/245285. JSTOR 2124332. ↑ "Father inspired Zamboni. But Parent of Mussolini's Assailant Long Ago Gave Up Anarchism. Blood Shed in Riots throughout Italy". The New York Times. 3 November 1926. Retrieved 25 February 2019. ↑ "The attempted assassination of Mussolini in Rome". Libcom.org. 10 September 2006. Retrieved 13 March 2009. ↑ Andrew (3 March 2005). "Remembering the Anarchist Resistance to fascism". Anarkismo.net. Retrieved 6 November 2010. ↑ Melchior Seele (11 September 2006). "1931: The murder of Michael Schirru". Libcom.org. Archived from the original on 22 January 2009. Retrieved 13 March 2009. ↑ Grand, Alexander de "Mussolini's Follies: Fascism in Its Imperial and Racist Phase, 1935–1940" pp. 127–47 from Contemporary European History, Volume 13, No. 2, May 2004, pp. 131–32. ↑ Grand, Alexander de "Mussolini's Follies: Fascism in Its Imperial and Racist Phase, 1935–1940" pp. 127–47 from Contemporary European History, Volume 13, No. 2 May 2004 p. 131. ↑ Robertson, Esmonde "Race as a Factor in Mussolini's Policy in Africa and Europe" pp. 37–58 from The Journal of Contemporary History, Volume 23, No. 1, January 1988 p. 40. ↑ Carl F. Goerdeler (1 April 1938). "Do Government Price Controls Work?". foreignaffairs.com. Council on Foreign Relations. Retrieved 10 August 2014. When Italy depreciated the lira in 1936, Mussolini ruled that all prices had to remain as they were. However, in May 1937 he had to increase wages by 15 percent because retail prices had gone up as a result of the rise in the cost of imported commodities. Nature cannot be ordered to renounce her principles. ↑ Falasca-Zamponi, Simonetta (2000). Fascist spectacle : the aesthetics of power in Mussolini's Italy (1st pbk. ed.). Berkeley: University of California Press. p. 67. ISBN 978-0-520-22677-7. ↑ Fattorini, Emma (2011). Hitler, Mussolini and the Vatican: Pope Pius XI and the speech that was never made ([English edition] ed.). Cambridge: Polity Press. p. xi. ISBN 978-0-7456-4488-2. ↑ Burgwyn, H. James (2012). Mussolini warlord : failed dreams of empire, 1940–1943. New York: Enigma Books. p. 7. ISBN 978-1-936274-29-1. ↑ Townley, Edward (2002). Mussolini and Italy. Oxford: Heinemann Educational. p. 173. ISBN 978-0-435-32725-5. ↑ Strang, Bruce On the Fiery March, New York: Praeger, 2003 p. 27. ↑ Strang, Bruce On the Fiery March, New York: Praeger, 2003 p. 26. 1 2 3 4 5 6 7 Sullivan, Barry "More than meets the eye: the Ethiopian War and the Origins of the Second World War" pp. 178–203 from The Origins of the Second World War Reconsidered A.J.P. Taylor and the Historians, London: Routledge, 1999 p. 193. 1 2 3 Kallis, Aristotle Fascist Ideology, London: Routledge, 2000 p. 124. 1 2 "Ethiopia 1935–36". icrc.org. 8 January 2008. Archived from the original on 1 December 2006. ↑ Brecher, Michael and Jonathan Wilkenfeld. Study of Crisis. University of Michigan Press, 1997. p. 109. ↑ John Whittam. Fascist Italy. Manchester, England; New York: Manchester University Press. p. 165. ↑ Sullivan, Barry "More than meets the eye: the Ethiopian War and the Origins of the Second World War" pp. 178–203 from The Origins of the Second World War Reconsidered: A.J.P. Taylor and the Historians, London: Routledge, 1999 p. 188. 1 2 3 4 Strang, Bruce On the Fiery March, New York: Praeger, 2003 p. 22. 1 2 Strang, Bruce On the Fiery March, New York: Praeger, 2003 p. 23. 1 2 3 4 Cassels, Alan "Mussolini and the Myth of Rome" pp. 57–74 from The Origins of the Second World War Reconsidered: A.J.P. Taylor and the Historians, London: Routledge, 1999 p. 63. 1 2 Sullivan, Barry "More than meets the eye: the Ethiopian War and the Origins of the Second World War" pp. 178–203 from The Origins of the Second World War Reconsidered: A.J.P. Taylor and the Historians, London: Routledge, 1999 p. 190. ↑ Cassels, Alan "Mussolini and the Myth of Rome" pp. 57–74 from The Origins of the Second World War Reconsidered A.J.P. Taylor and the Historians, London: Routledge, 1999 p. 65. 1 2 3 4 5 6 7 8 Sullivan, Barry "More than meets the eye: the Ethiopian War and the Origins of the Second World War" pp. 178–203 from The Origins of the Second World War Reconsidered: A.J.P. Taylor and the Historians, London: Routledge, 1999 p. 187. ↑ Sullivan, Barry "More than meets the eye: the Ethiopian War and the Origins of the Second World War" pp. 178–203 from The Origins of the Second World War Reconsidered: A.J.P. Taylor and the Historians, London: Routledge, 1999 pp. 187–88. ↑ Sullivan, Barry "More than meets the eye: the Ethiopian War and the Origins of the Second World War" pp. 178–203 from The Origins of the Second World War Reconsidered: A.J.P. Taylor and the Historians, London: Routledge, 1999 p. 189. ↑ Sullivan, Barry "More than meets the eye: the Ethiopian War and the Origins of the Second World War" pp. 178–203 from The Origins of the Second World War Reconsidered: A.J.P. Taylor and the Historians, London: Routledge, 1999 pp. 189–90. ↑ Sullivan, Barry "More than meets the eye: the Ethiopian War and the Origins of the Second World War" pp. 178–203 from The Origins of the Second World War Reconsidered: A.J.P. Taylor and the Historians, London: Routledge, 1999 p. 182. 1 2 Stang 1999, p. 172. ↑ Stang 1999, pp. 172–74. ↑ Strang, Bruce On the Fiery March, New York: Praeger, 2003 p. 47. ↑ Cassels, Alan "Mussolini and the Myth of Rome" pp. 57–74 from The Origins of the Second World War Reconsidered A.J.P. Taylor and the Historians edited by Gordon Martel, London: Routledge, 1999 p. 64. ↑ Stang 1999, pp. 173–74. 1 2 Stang 1999, pp. 174–75. ↑ Lowe, CJ (1967). Italian Foreign Policy 1870–1940. Routledge. ISBN 978-0-415-26597-3. ↑ Galleazo, Ciano, Diary, 1937–1943, Enigma Books, 2008, 624 p., ISBN 978-1929631025, p. 154. ↑ Strang, Bruce On the Fiery March, New York: Praeger, 2003 p. 200. ↑ Strang, Bruce On the Fiery March, New York: Praeger, 2003 pp. 200–01. 1 2 Kallis 2002, p. 153. ↑ Cassels, Alan "Mussolini and the Myth of Rome" pp. 57–74 from The Origins of the Second World War Reconsidered A.J.P. Taylor and the Historians edited by Gordon Martel, London: Routledge, 1999 p. 67. 1 2 3 Kallis 2002, p. 97. 1 2 3 4 5 6 Knox, MacGregor (1986). Mussolini Unleashed, 1939–1941: Politics and Strategy in Fascist Italy's Last War. Cambridge University Press. ISBN 978-0-521-33835-6. 1 2 "Italy Declares War". ThinkQuest.org. 8 January 2008. Archived from the original on 20 December 2007. ↑ "Mussolini: Speech of the 10 June 1940, Declaration of War on France and England". 2 November 2008. ↑ Samson, Anne (1967). Britain, South Africa and East African Campaign: International Library of Colonial History. I.B. Tauris & Co Ltd. ISBN 978-0-415-26597-3. ↑ Mollo, Andrew (1987). The Armed Forces of World War II. I.B. Tauris & Co Ltd. ISBN 978-0-517-54478-5. ↑ Weinberg 2005, p. 276. ↑ Marino, James I. (5 December 2016). "Italians on the Eastern Front: From Barbarossa to Stalingrad". Warfare History Network. Retrieved 17 November 2018. ↑ Weinberg 2005, pp. 276–77. 1 2 Weinberg 2005, p. 277. ↑ "1941: Germany and Italy declare war on US". BBC News. 11 December 1941. ↑ __. Trial of German Major War Criminals. 3. p. 398. 1 2 3 4 Whittam, John (2005). Fascist Italy. Manchester University Press. ISBN 978-0-7190-4004-7. ↑ "Modern era". BestofSicily.com. 8 January 2008. 1 2 3 Shirer, William (1960). The Rise and Fall of the Third Reich. New York: Simon & Schuster. ISBN 978-0-671-72868-7. 1 2 Annussek, Greg (2005). Hitler's Raid to Save Mussolini. Da Capo Press. ISBN 978-0-306-81396-2. 1 2 Moseley, Ray (2004). Mussolini: The Last 600 Days of Il Duce. Taylor Trade. ISBN 978-1-58979-095-7. ↑ Speer, Albert (1995). Inside the Third Reich. London: Weidenfeld & Nicolson. pp. 420–21. ISBN 978-1842127353. The supreme commanders in the Operational Zone Adriatic Coast consisting of the provinces of Friaul, Görz, Triest, Istrien, Fiume, Quarnero, Laibach, and in the Prealpine Operations Zone consisting of the provinces of Bozen, Trient and Belluno receive the fundamental instructions for their activity from me. Führer's headquarters, 10 September 1943. 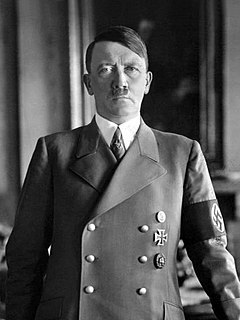 The Führer Gen. Adolf Hitler". ↑ Nicola Cospito; Hans Werner Neulen (1992). Salò-Berlino: l'alleanza difficile. La Repubblica Sociale Italiana nei documenti segreti del Terzo Reich. Mursia. p. 128. ISBN 978-88-425-1285-1. ↑ Moseley (2004), p. 26. ↑ Klein, Christopher (28 April 2015). "Mussolini's Final Hours, 70 Years Ago". History.com. Retrieved 3 February 2017. ↑ Hooper, John (28 February 2006). "Urbano Lazzaro, The partisan who arrested Mussolini". The Guardian. Retrieved 24 October 2014. ↑ "What Price Brutus?". Time Magazine. 7 April 1947. Retrieved 24 October 2014. ↑ Video: Beaten Nazis Sign Historic Surrender, 1945/05/14 (1945). Universal Newsreel. 1945. Retrieved 20 February 2012. ↑ Peter York (2006). Dictator Style. San Francisco: Chronicle Books. pp. 17–18. ISBN 978-0-8118-5314-9. ↑ Jesse Greenspan (25 October 2012). "9 Things You May Not Know About Mussolini". ↑ Peter Neville. Mussolini. Oxon, UK; New York: Routledge, 2005. p. 176. 1 2 Roberts, Jeremy (2006). Benito Mussolini. Minneapolis, MN: Twenty-First Century Books, p. 60. ↑ Peter Neville (2004). Mussolini. Psychology Press. p. 84. ISBN 978-0-415-24989-8. ↑ Edward Townley (2002). Mussolini and Italy. Heinemann. pp. 49–. ISBN 978-0-435-32725-5. 1 2 3 4 5 Joshua D. Zimmerman (2005). Jews in Italy Under Fascist and Nazi Rule, 1922–1945. Cambridge University Press. p. 62. ISBN 978-0-521-84101-6. ↑ Gillette, Aaron (2002). Racial Theories in Fascist Italy. Routledge. p. 45. ISBN 978-0-415-25292-8. ↑ Gillette, Aaron (2002). Racial Theories in Fascist Italy. Routledge. p. 44. ISBN 978-0-415-25292-8. ↑ Institute of Jewish Affairs (2007). Hitler's ten-year war on the Jews. Kessinger Publishing. p. 283. ISBN 978-1-4325-9942-3. ↑ Hollander, Ethan J (1997). Italian Fascism and the Jews (PDF). University of California. ISBN 978-0-8039-4648-4. Archived from the original (PDF) on 15 May 2008. ↑ Peter Egill Brownfeld (Fall 2003). "The Italian Holocaust: The Story of an Assimilated Jewish Community". The American Council for Judaism. Retrieved 23 March 2011. 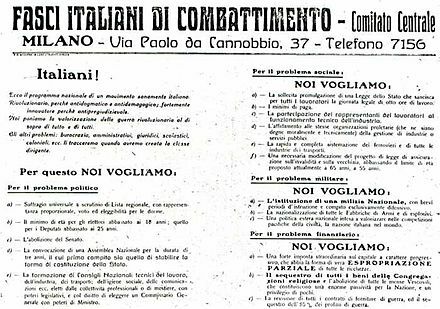 Ovazza started a Jewish fascist newspaper, "La Nostra Bandiera" (Our Flag) in an effort to show that the Jews were among the regime's most loyal followers. ↑ Davide Rodogno (2006). Fascism's European Empire: Italian Occupation During the Second World War. Cambridge University Press. p. 65. ISBN 978-0-521-84515-1. ↑ Zuccotti, Susan (1987). Italians and the Holocaust. New York: Basic Books Inc. p. 36. ↑ Zuccotti, Susan (1987). Italians and the Holocaust. New York: Basic Books Inc. pp. 148, 149. ↑ Zuccotti, Susan (1987). Italians and the Holocaust. New York: Basic Books Inc. p. 165. ↑ Gillette, Aaron (2002). Racial Theories in Fascist Italy. Routledge. p. 95. ISBN 978-0-415-25292-8. ↑ Arielli, Nir (2010). Fascist Italy and the Middle East, 1933–40. Palgrave Macmillan. pp. 92–99. ISBN 978-0-230-23160-3. ↑ "Former fascists seek respectability". The Economist. 4 December 2003. Retrieved 7 April 2014. ↑ , note to Star Maker by Olaf Stapledon, p. 305. ↑ The History of the Beano. Dundee, Scotland: D.C. Thomson & Co. Ltd. 2008. pp. 77–78. ISBN 978-1-902407-73-9. ↑ "The Dictators Rulebook". Nat Geo TV . National Geographic. Retrieved 2 September 2018. ↑ "Dictators Rulebook". Radio Times . Retrieved 2 September 2018. ↑ "Dictators Rulebook". National Geographic. Retrieved 2 September 2018. 2007. Mussolini's Cities: Internal Colonialism in Italy, 1930–1939, Cambria Press. Bosworth, R.J.B. 2006. "Mussolini's Italy: Life Under the Dictatorship 1915–1945". London, Allen Lane. De Felice, Renzo (1965). Mussolini. Il Rivoluzionario,1883–1920 (in Italian) (1 ed.). Torino: Einaudi. De Felice, Renzo (1966). Mussolini. Il Fascista. 1: La conquista del potere, 1920–1925 (in Italian) (1 ed.). Torino: Einaudi. De Felice, Renzo (1969). Mussolini. Il Fascista. 2: L'organizzazione dello Stato fascista, 1925–1929 (in Italian) (1 ed.). Torino: Einaudi. De Felice, Renzo (1974). Mussolini. Il Duce. 1: Gli anni del consenso, 1929–1936 (in Italian) (1 ed.). Torino: Einaudi. De Felice, Renzo (1981). Mussolini. Il Duce. 2: Lo stato totalitario, 1936–1940 (in Italian) (1 ed.). Torino: Einaudi. De Felice, Renzo (1990). Mussolini. L'Alleato, 1940–1942. 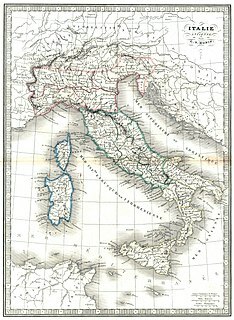 1: L'Italia in guerra I. Dalla "guerra breve" alla guerra lunga (in Italian) (1 ed.). Torino: Einaudi. De Felice, Renzo (1990). Mussolini. L'Alleato. 1: L'Italia in guerra II: Crisi e agonia del regime (in Italian) (1 ed.). Torino: Einaudi. De Felice, Renzo (1997). Mussolini. L'Alleato. 2: La guerra civile, 1943–1945 (in Italian) (1 ed.). Torino: Einaudi. Gregor, Anthony James (1979). Young Mussolini and the intellectual origins of fascism. Berkeley and Los Angeles, California; London, England: University of California Press. ISBN 978-0520037991. Haugen, Brenda (2007). Benito Mussolini: Fascist Italian Dictator. Minneapolis, MN: Compass Point Books. ISBN 978-0-7565-1988-9. Kroener, Bernhard R.; Muller, Rolf-Dieter; Umbreit, Hans (2003). Germany and the Second World War Organization and Mobilization in the German Sphere of Power. VII. New York: Oxford University Press, Inc. ISBN 978-0-19-820873-0. Lowe, Norman. Italy, 1918–1945: the first appearance of fascism. In Mastering Modern World History. Morris, Terry; Murphy, Derrick. Europe 1870–1991. Moseley, Ray. 2004. Mussolini: The Last 600 Days of Il Duce. Dallas: Taylor Trade Publishing. O'Brien, Paul. 2004. Mussolini in the First World War: The Journalist, the Soldier, the Fascist. Oxford: Berg Publishers. Painter, Jr., Borden W. (2005). Mussolini's Rome: rebuilding the Eternal City. Petacco, Arrigo (ed.). 1998. L'archivio segreto di Mussolini. Mondadori. ISBN 88-04-44914-4. Smith, Denis Mack (1982). Mussolini: A biography, Borzoi Book published by Alfred A. Knopf, Inc. ISBN 0-394-50694-4. Sternhell, Zeev; Sznajder, Mario; Asheri, Maia (1994). The Birth of Fascist Ideology: From Cultural Rebellion to Political Revolution. Princeton, NJ: Princeton University Press. ISBN 978-0-691-04486-6. Stang, G. Bruce (1999). "War and peace: Mussolini's road to Munich". In Lukes, Igor; Goldstein, Erik. The Munich crisis 1938: prelude to World War II. London: Frank Cass. pp. 160–90. Tucker, Spencer (2005). Encyclopedia of World War I: a political, social, and military history. Santa Barbara, California: ABC-CLIO. Weinberg, Gerhard (2005). A World in arms. Cambridge: Cambridge University Press. Zuccotti, Susan. 1987. Italians and the Holocaust Basic Books, Inc.
Giovanni Hus, il Veridico (Jan Hus, True Prophet), Rome (1913). Published in America as John Hus (New York: Albert and Charles Boni, 1929). Republished by the Italian Book Co., NY (1939) as John Hus, the Veracious. The Cardinal's Mistress (trans. Hiram Motherwell, New York: Albert and Charles Boni, 1928). There is an essay on "The Doctrine of Fascism" written by Benito Mussolini that appeared in the 1932 edition of the Enciclopedia Italiana , and excerpts can be read at Doctrine of Fascism. There are also links to the complete text. La Mia Vita ("My Life"), Mussolini's autobiography written upon request of the American Ambassador in Rome (Child). Mussolini, at first not interested, decided to dictate the story of his life to Arnaldo Mussolini, his brother. The story covers the period up to 1929, includes Mussolini's personal thoughts on Italian politics and the reasons that motivated his new revolutionary idea. It covers the march on Rome and the beginning of the dictatorship and includes some of his most famous speeches in the Italian Parliament (Oct 1924, Jan 1925). Vita di Arnaldo (Life of Arnaldo), Milano, Il Popolo d'Italia, 1932. Scritti e discorsi di Benito Mussolini (Writings and Discourses of Mussolini), 12 volumes, Milano, Hoepli, 1934–1940. Parlo con Bruno (Talks with Bruno), Milano, Il Popolo d'Italia, 1941. Storia di un anno. Il tempo del bastone e della carota (History of a Year), Milano, Mondadori, 1944. 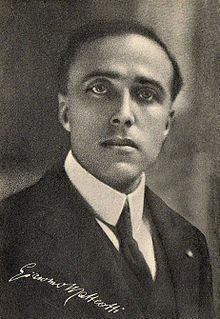 From 1951 to 1962, Edoardo and Duilio Susmel worked for the publisher "La Fenice" to produce Opera Omnia (the complete works) of Mussolini in 35 volumes. Time Magazine, 5 April 1937 (5 April 1937). "Islam, Duce, and Duke" . Retrieved 19 August 2009. Time Magazine, 7 May 1945 (7 May 1945). "Death in Milan" . Retrieved 20 August 2009.